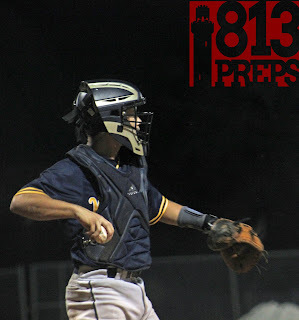 LUTZ – In a battle of two top-six teams in the 813Preps Weekly Rankings, the Steinbrenner Warriors fought the whole way en route to a nine inning, 9-8, victory over Wharton at home on Tuesday night. 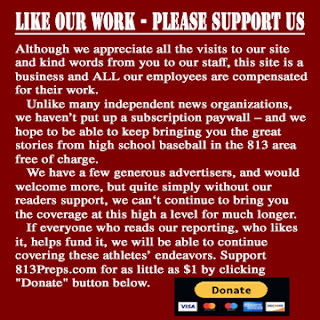 The teams battled to a six-all tie after Steinbrenner took a three-run lead in the fourth before Wharton roared right back with a three-spot of its own in the next half inning. Wharton drew first blood in the extra frame on an RBI single from Grady Maguire to score Steven Hotinski. Steinbrenner fought right back in the bottom half with Donovan Garcia’s third RBI of the day to get his brother, Griffin, home to extend the ball game. The Warriors tried to end it there, but Ryan Lowder was gunned down going for home. Steinbrenner junior Donovan Garcia was 3-for-5 with four RBI in the win. Zach Ehrhard got his third hit of the affair in the ninth with an RBI single to left field to score Nick Albury, giving the Wildcats an 8-7 advantage. Michael Rivera was sent in to try and finish things off, but he would end up taking the loss on the decision. Once again, Steinbrenner fought back in the ninth. Back-to-back doubles from Adam Fisher and Will Farrell (the second being the tying hit) got the Warriors off to a solid start in the inning. Runners sat on the corner after Jacob Bluffstone walked with two outs. Setting up leadoff hitter, junior Griffin Garcia who stepped to the plate and fired a 2-2 pitch deep to left center. Wharton’s centerfielder dove at it – the slightest mistiming of his dive was enough for the ball to drop and Garcia to walk it off for Steinbrenner. Steinbrenner really was a group of Warriors as they came back from three different deficits to take the win over their fellow North Tampa foe. The victory is a huge one as the Warriors get a bunch of momentum going into their final district battle with Plant on Thursday night, but Steinbrenner must first tangle with Carrollwood Day on the road on Wednesday. The Garcia brothers – Griffin slotted first and Donovan slotted third – accounted for five hits and seven RBI on the night. Farrell and Fisher’s doubles were the only extra base hits for Steinbrenner, which collected 11 hits on the night. Fisher had a two-hit game with a pair of runs scored. Mikey Mullins was 2-for-5. Steinbrenner pitcher Chris Reynolds entered in the fifth and fired 4 2/3 innings of four-hit baseball to earn the win in relief. 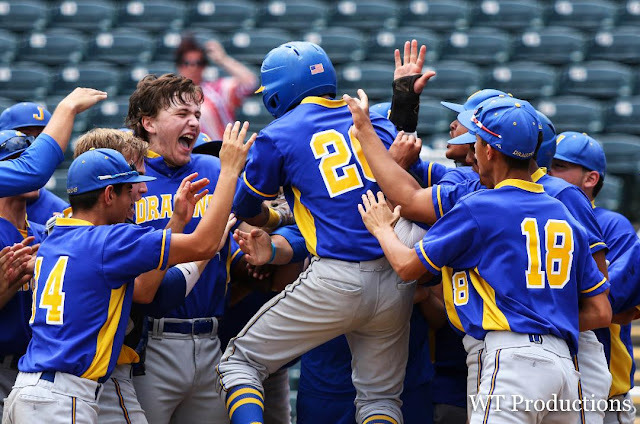 Ehrhard, Maguire and Colton Calleja all collected three-hit games for Wharton. The Wildcats didn’t have an extra base hit but did have 16 singles on the night.